Flaming rocks from erupting volcanoes seared Col’s sides as he tucked his dragon wings tight and dove through the air. He chased the fleeing traitors from his world into a new one—an unknown one—through the portal horizon that shimmered like liquid magick. His wings pumped hard. Anger surged through his veins, spurring him on. Kill. Kill. Kill. His dragon chanted inside his head. They had taken everything. He would take it back. The two remaining dragons who’d murdered the House of Li’Vhram would die an excruciating and painful death. Soon he’d be able to sink his talons into their flesh and rip them to shreds. Soon his family’s deaths would be avenged. Soon justice would be served. Fire was coming to claim their souls. The intense heat of Reylea’s burning air disappeared as he broke through the surface of the portal into unfamiliar blue skies. A blast of bitter cold wind made him blink hard. The land around him was white, and the sun reflected off the surface, blinding him. He pumped his wings, struggling to adjust to a new gravity. His body dropped, smashing through the trees to the ground below. He thrashed about until he was finally upright and on all four of his claws. The wind was numbingly cold with a scent on the air he didn’t recognize. Reylea, his home, was all jungle and desert. It was never cold. Never like this… he raised a claw and looked down at the large print it’d made in the white powder coating the ground. He sniffed and licked it, surprised to find that it melted to water on his tongue. He walked forward from the trees into a large clearing on the side of a hill. Jagged peaks rose around him on three sides. He squinted at the strange brightness. Movement caught his eye to his left. A bugle call of a dragon hunting cut through the air a moment later. They’d been in this new world only a few minutes. What could the traitors possibly have found to hunt? A scream broke the silence next. Col bounded forward a few steps and launched himself into the air. He pumped his wings, climbing into the sky, and dipped toward the sound of shouts and another scream. Then came the sickening thud of a body slamming against something hard. Had they killed someone? He dove to the ground, shifting just as his claws touched the white powder. Feet replaced claws. He ran forward, through the trees tracking by scent, even in his human form. The two dragons had shifted as well. The strong scent of the trees burned at his nostrils like the medicine the healers of Reylea used to treat lung sickness. “Now you’ve broken her,” a female voice screeched through the silence of the woods, like the scream of a panther, sharp and cold and heartless. Col slowed his run, careful to pick through the trees without sounding like a bellowing river cow. “Neither are you, sister.” The male’s voice was dark and angry, brewing like a summer storm on the horizon. The female scoffed but didn’t argue further. Col crept around a small cluster of trees with green needles clinging to their branches. The cold white powder had weighed them down, so they almost touched the ground, providing him with excellent cover. With the element of surprise on his side, taking down the two traitors wouldn’t be a challenge. Kill. His dragon whispered inside his head. They deserve to die. He peered around the last tree in the clump. The female—Sefa—was leaning against the trunk of a tall tree looking bored, while her brother, Jaha was crouched over a bundled-up form on the ground, likely the injured female they’d been speaking about. Col’s lip curled as fury built in his blood. Like the volcanoes erupting and destroying his home world, he was ready to boil and burn these two for their part in murdering his family. He leapt forward as Jaha started to lift the injured woman from the ground. Col shifted to dragon form in mid-leap, knocking the traitor away from the woman with a roar. Jaha shifted before Col could bite down, but he got a good slice at the other dragon’s stomach before he tore loose from Col’s grip. He pumped his wings, following Jaha high into the sky. Another cry from below made him shift direction quickly. The female dragon had joined the fray, and shot through the air, missing him by inches. He banked a sharp turn and came face to face with both of them. This was it. This was the moment he would deliver justice for their crimes. Col dove at Jaha first since he was already bleeding. The female was smaller and less of a threat anyway. Jaha turned, protecting his stomach, but Col got in a good bite on his back, ripping off several armored spikes in the process. He trumpeted into the sky and backed off just as the female came at him. Col turned and swatted her away with a well-trained swipe of his spiked tail. Sefa fell, landing in the white powder near the woman on the ground. He’d been trained by the royal guard and was one of the best warriors of his house. These two didn’t have a chance…and yet they kept coming at him. They knew they would die. He could see the fear in their wide-slitted eyes and hear the way their heartbeats raced in their chests. Sefa swatted the blue bundled body across the clearing angrily before leaping back into the air. Col shouldn’t care. Shouldn’t have looked. But he saw it and there was no going back. The woman was glowing. Her soul. It was calling to him. Every part of him seized in that moment. His heart stopped. His lungs froze. His skin tightened. He gulped for a breath of the cold air and ducked another hit from Jaha, sending the lesser dragon careening into the trees. Sefa tried for a hit too, but he sent her flailing off through the sky with a solid blow to her chest. He roared, bellowing a call across the sky. Both of them trumpeted back, but instead of charging, they swooped down and fled, flying just above the canopy of white-covered trees. Col puffed out a breath of fire after their retreating figures. Nothing would slake his fury but their deaths. But he wouldn’t abandon his mate. Not even for those two traitors. This world was cold, and the scents burned his nostrils. He peered back over his shoulder. The portal was lower than it’d been earlier. The magick-bender must’ve realized she would send most of the Reyleans tumbling to their deaths if it weren’t adjusted. Not everyone had the body of a dragon that could absorb a fall like he had. The scent of fresh blood drew all his attention back to the woman on the ground. She was so small and helpless. Even now, some predator could be stalking her helpless form. He’d find a shelter to hide her in. Keep her safe and well fed. Then he’d hunt down Sefa and Jaha. Their deaths wouldn’t be today, but they would be soon. Col flew back to the ground, landing softly and shifted. The transformation from his animal form to his two-legged version was as seamless as breathing. He ran across the clearing, toward the place where the woman had been. Broken trees littered the way back. She was still there. Her light blue covering rose and fell with each breath. He could hear the strength in her heart beat. She was a fighter. Mate. His dragon growled from inside his chest. She lay face down on the ground. Helpless. Unconscious. Why now? Why would Fate choose this moment to give me a mate? Col lifted her gently from the ground. He carried her beneath the shelter of one of the taller trees. Once glance at her face and all thoughts of vengeance melted away, filling his heart with a love he’d never experienced before. 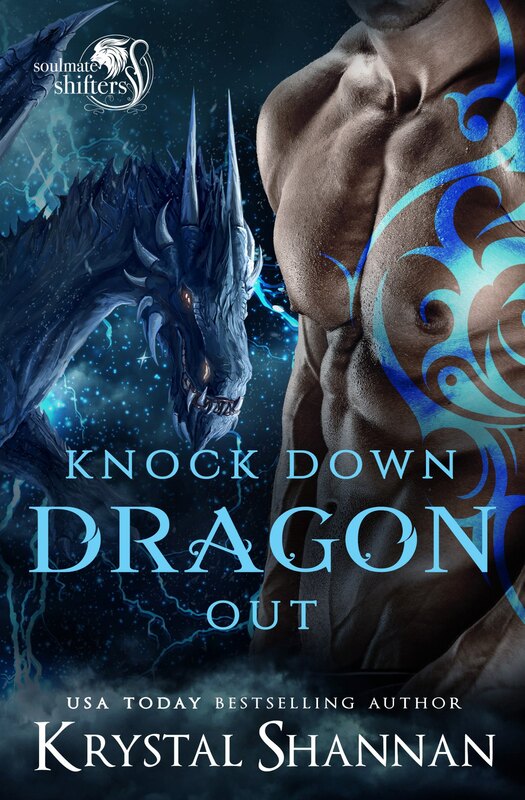 The muscles in his arms trembled, and his dragon preened. He placed her flat on the snowy ground. Her skin was the color of desert sand. Gorgeous and smooth. Her curls were wild and created a shining halo around her face. But breathtaking beauty wasn’t what had his heart kicking the inside of his ribcage. He’d seen her glow—the soul call—from the air. Felt its pull. Yet, it was so much more up close. No. It couldn’t be. He couldn’t have a mate in this strange world. He was here for vengeance. In all his years, Fate had never seen fit to give him a mate. He’d had women in his bed from time to time, but never a mate. Never a woman who could give him more than a few moments of meaningless pleasure. Mine. His dragon repeated. Take her. Col huffed out a growl and turned to walk away but couldn’t. The magick of the soul call was strong. He couldn’t just leave her here either. Wild animals would find her. Whatever predators lived in this wilderness would be dangerous. Nothing so soft could survive this bitter cold, which begged the question as to why this small slip of a female was out here all alone. Was she running from something? Had someone abandoned her already? Fire warmed his belly at the thought of someone hurting or mistreating his mate. He glanced down at his hands. The left was stained with blood that wasn’t his. The scent was different. His attention locked in on the female again. She was injured, and he was doing nothing. Col ripped a strip of purple fabric from the swath tied around his waist. The leather strips hanging from his wide belt flapped against his legs in the cold wind. His dragon was making up for the temperature change, keeping his core warm, but it didn’t make the bite of the wind any less uncomfortable. His entire torso was bare and feeling the discomfort of this new world’s environment. He pulled back the woman’s hood, surprised to find that her hair was shorter than his, barely hanging past her ears in silky brown spirals. The wound was on the back of her head, near the base. It wasn’t deep enough to need to be cauterized or sewn. Col fastened the fabric, wrapping it twice around her head before tying it tightly. The bleeding wasn’t flowing too strongly. He’d bandaged enough wounds to know hers would stop soon now that it was dressed. Her face was exquisite. Even though he couldn’t see her eyes, she had strong lines and a mouth that he wanted to explore. There was something about her scent…almost like she was in heat. Like her very essence called to him. He leaned closer and sniffed her neck, breathing in the sweet fragrance of her. Mine. His dragon rumbled again. “Yes,” he assured his inner beast. He was keeping her. He was just going to find a safe place to hide her for a while and then continue after the two traitors—Jaha and his sister. He had a mission. He was stronger than Fate’s call. He could resist the mate Fate had placed in front of him…for a while. It was a test of his will. Nothing more.